Children getting sick it’s part of life and growing up so we do our best to be prepared for that moment, whenever it may be. What can the children’s crisis insurance lump sum for? The technical stuff that makes this a good idea to consider. If you'd like to know more about including your children in your family protection plan Contact us here. When a child gets sick, the whole family suffers. Outings get canceled and family plans usually have to be rearranged until they're well again. Now that might be OK for the usual colds, flues, and scrapped knees, but what happens if your child needs more than a band-aid and some time at home. We know sick children recover faster when they have a loving parent or carer beside them. But for many parents taking time off work to do this just isn’t an option regardless of how important it is and how much the parent wants to be there. In the same way, we all recognise the necessity of having a family first aid kit on hand, thinking about insuring your children against major medical traumas makes perfect sense - because a sick child is a whole family issue. The good news is that medical intervention and earlier detection means the mortality rates are dropping, but we’re not at zero yet and a full recovery can take years and the bills pile up. Have all the time off work you need to be there with them. While money can’t buy a quick recovery, it can ease the financial pressures you and your family will face. Four year old Tyler pulled a hot saucepan of partly-made toffee onto himself the night before his planned birthday party was to happen and caused burns to his face and hands. Fortunately, on Tyler’s 2nd birthday his grandparents paid for their grandchildren to have Children’s Crisis Insurance put into place as part of the family’s protection plan. Tyler’s family had a lot of challenges to work through. Thankfully, concerns about money weren’t one of them. Crisis insurance can pay a lump cash sum if the life insured suffer one of the policy’s listed medical conditions. This cover is available for adults and for their children too. In fact, some insurance companies provide partial automatic child cover if parents take out their own crisis insurance cover. Q: Is this the same as private health cover? No private health insurance is only part of the story. Private health insurance only covers hospital stays and some medical/extras expenses. It won’t cover long-term rehabilitation, alterations to your home for mobility reasons or long-term nursing care. Q: How do I know the best option for me? That’s where you need Sapience. You can contact us here. The minimum age of entry for this type of policy is 2 years of age. The minimum amount of cover you can purchase starts from $10,000 and the maximum is over $250,000. The lump sum is tax-free and can be used to meet additional expenses when you need it most. Children’s crisis cover usually covers a smaller number of medical issues than a full adult policy. One of the best features may be that a policy taken out as a child, can later transfer to a full adult policy at age 18 – and here’s the important thing to understand – without any new medical assessment or interview needed – regardless of any changes in your health or occupation. The sooner you take out a child crisis policy the better because some longer term health issues don’t show up till later in life. 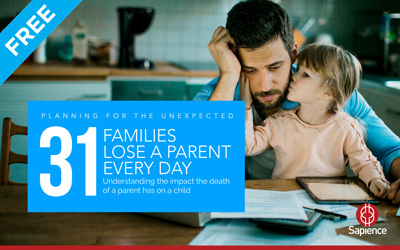 These types of policies can be a game changer for young families and single parents who would struggle financially if one of their children were to suffer a major medical crisis. Emma’s parents thought she’d brought home yet another cough from the child care centre. When the symptoms persisted for some time they went back to their GP who offered a blood test. The results showed Emma had leukaemia. Emma was soon in and out of the children’s hospital on a regular basis and had chemotherapy for twelve months and her parents moved house to be closer to the hospital. Fortunately Ben and Rachel didn’t have to worry about financial issues as well at this difficult time. Their financial adviser had them take out child crisis cover as soon as Emma reached 2 years of age (the earliest possible time when she would qualify for child crisis insurance). As soon as they received Emma’s initial diagnose of leukaemia their adviser helped them lodged a claim and they received $187,000 as a lump sum payment.Finally, after two years, the doctors gave Emma an optimistic prognosis. And a much-needed family holiday to Disneyland once Emma had recovered. Children get sick—that’s a difficult part of life for every family. But every now and then a child can get really sick and suffer a significant trauma or illness that affects the entire family.